How to watch Enemy of the State (1998) on Netflix Australia! Sorry, Enemy of the State is not available on Australian Netflix, but you can unlock it right now in Australia and start watching! With a few simple steps you can change your Netflix region to a country like Hong Kong and start watching Hong Kongese Netflix, which includes Enemy of the State. 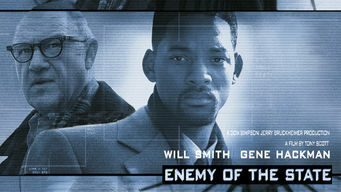 We'll keep checking Netflix Australia for Enemy of the State, and this page will be updated with any changes. Enemy of the State is not available in Australia BUT it can be unlocked and viewed! After a hacker slips an incriminating video into his pocket, a hotshot lawyer finds himself fleeing from a rogue National Security agent. Blindsided by Big Brother, he'll break the law to live. But is the real enemy the whistle-blower or the bureaucrats? There is a way to watch Enemy of the State in Australia, even though it isn't currently available on Netflix locally. What you need is a system that lets you change your Netflix country. With a few simple steps you can be watching Enemy of the State and thousands of other titles! Watch "Enemy of the State"